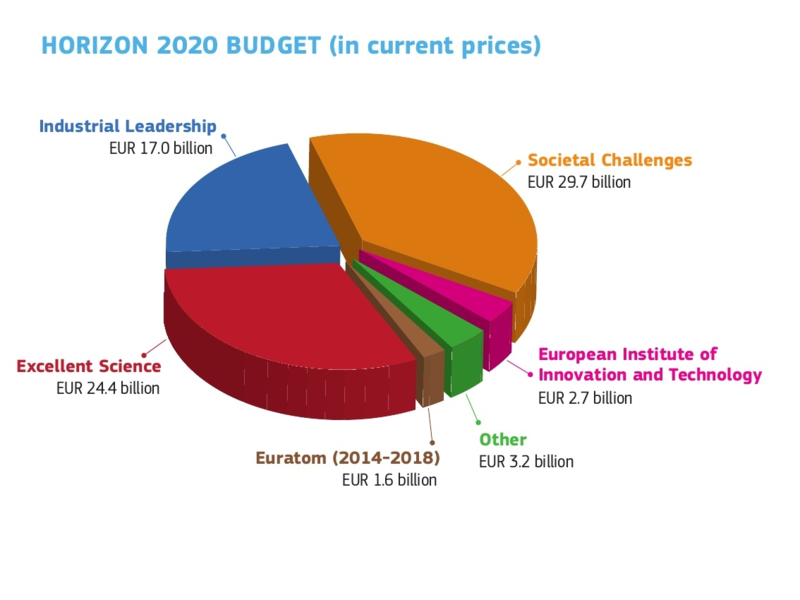 Horizon 2020 is the is the biggest ever EU Research and Innovation programme, with nearly €80 billion of funding available over 7 years (2014 to 2020). In the first three years, the EU made contribution of €24.8 billion to 13,903 projects. Research is vital for society. The EU’s blueprint for a smart, sustainable and inclusive society requires funding into many areas, including health, energy, transport and climate action. Life-saving vaccines, the internet and the MRI and just 3 examples of the results of past investment into research. Research trains the next generation of scientists, engineers, doctors and teachers. Investment into research builds a science and engineering workforce which is crucial for the future of Europe. Horizon 2020 includes provisions to support public-private partnerships, which means that industry will also invest just under €10 billion into a range of initiatives which include research into innovative medicines, efficient transport and renewable energies. Where does mF2C fit in? So far, 27.1% of H2020 funding has been awarded to research and innovation for ICT. Funding in this area is critical to make sure Europe stays ahead on the global stage and remains competitive in terms of growth and employment. It is also important that development of innovative technologies is not only left to large corporations, which may be tempted to direct research motivated by profit alone, as we also have to take into account wider issues such as data protection, freedom of access and so on. mF2C is using EU funding to create a management framework for cloud and fog computing resources. A large part of this is the much-talked-about Internet of Things (IoT), which will undoubtedly improve services for citizens in many areas. Indeed, the mF2C use cases are just 3 examples of how IoT devices will improve life for EU citizens. At the same time, IoT delivers these added-value services by handling huge amounts of data that is captured processed and analysed via a multitude of devices. It is critical that this data is correctly handled, not just from a technical standpoint but also from a privacy perspective. This is one area where the mF2C project is active. The consortium is working not only on the technical aspects in this challenging domain, but also on important issues such as privacy, trust and cooperation. The impact of the new General Data Protection Regulation (GDPR) is being evaluated as part of the Ethics Issues Management Plan to make sure the project outcomes conform to the new legislations. EU funding allows projects like mF2C to carry out research independently and objectively without having regard to commercial concerns, while at the same time keeping an eye on the outcome for the society.